Are you ready to be jaw-droppingly amazed right now? I just received this video and OMG. I am in awe. David Garrett has amd skills on the violin like no other. I have never seen such a cool video involving a violin. 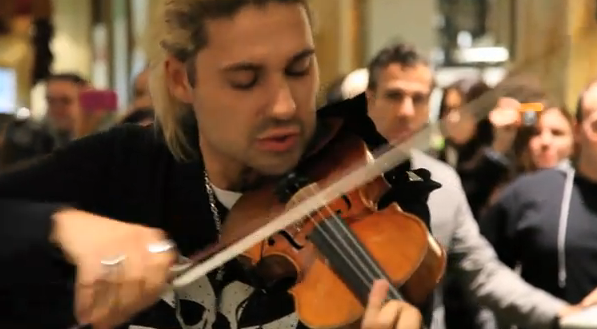 International superstar and rock violinist David Garrett performs his version of Michael Jackson’s “Smooth Criminal” with a little help from employees and excited onlookers inside Eataly, New York City’s renowned artisanal food market and eatery created by Mario Batali and Joe and Lydia Bastianich. David Garrett is a worldwide phenom, having appeared on The Today Show, The Oprah Winfrey Show, Fox News, Good Morning America, CNN, The Early Show and 2 solo PBS specials, as well as playing regularly in front of thousands of fans on a nightly basis across the world. This performance, featuring The Street Beats Group, brought a special “only in New York” treat to dozens of unsuspecting lunchtime patrons at Eataly. By the way…how hot is he?